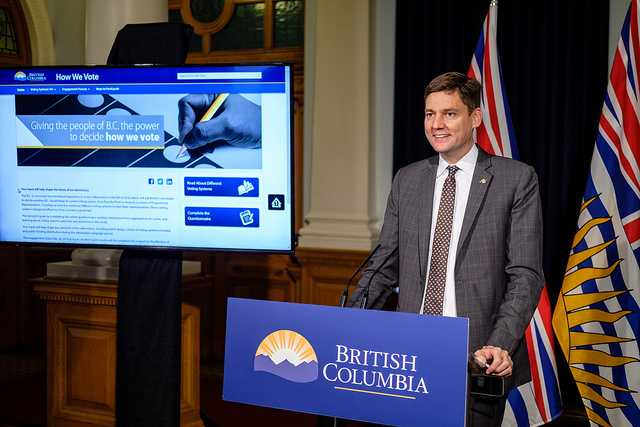 British Columbians can now provide input to help shape next year’s provincial referendum on electoral reform as part of the How We Vote public engagement. Today through Feb. 28, 2018, British Columbians can visit engage.gov.bc.ca/HowWeVoteto learn about the characteristics of voting systems used here and elsewhere in the world, and to provide input on key elements of the referendum — including ballot design, choice of voting systems and public funding distribution during the referendum campaign period. British Columbians are encouraged to visit the website to complete an online questionnaire, provide comments and review the submissions of organizations. In the new year, more information and resources will be added to the site, including educational videos and graphics, while libraries will be provided with information kits to help engage British Columbians in advance of the fall 2018 referendum. The Attorney General will serve as a neutral arbiter throughout the process to ensure the referendum is conducted fairly and in accordance with B.C. law. Following the public engagement, the Ministry of Attorney General will prepare a report with recommendations, which will be presented by the Attorney General to cabinet and made public in advance. The Attorney General will recuse himself from all cabinet and caucus debate and decisions regarding the referendum. Government introduced the Electoral Reform Referendum Act, 2018, on Oct. 4, 2017, to establish the referendum, which will be held no later than Nov. 30, 2018. The referendum will be conducted through a mail-in ballot, with results binding at 50%+1 of the vote provincewide. If a new voting system is approved, legislation will be introduced in time for the 2021 provincial general election.